A4 Size 7.3 x 9.65 in. A4 Mounted 7.3 x 9.65 in. Historically, Shantideva (Tib. Zhi ba lha), meaning the ‘Peaceful Divinity’, was one of the great Indian Mahayana proponents of the Madhyamaka Prasangika school, who lived between the late 7th and mid 8th centuries. His most celebrated work is the Bodhisattvacaryavatara, or ‘Guide to the Bodhisattva’s Way of Life’, which is widely studied as a practice manual in the Tibetan tradition. However, Abhayadatta’s legend of Shantideva as the Mahasiddha Bhusuku, places him in the reign of King Devapala (c. 810-850) of the East-Indian Pala Dynasty, who patronized Buddhism in its heartland of Magadha, and in particular Magadha's monastic academies of Nalanda, Vikramashila and Odantapuri. As a pious prince Shantideva received ordination into the mahasanghika order of Nalanda University, but among the Abbot’s three hundred diligent students he alone was the lazy exception. When informed of his behavior, King Devapala named him Bhusuku, meaning the ‘Idler’, as all he seemed to do was eat, sleep and excrete, apart from taking a daily stroll to help encourage his appetite. “But do you not recognize me?” asked Manjushri. “No, I have no idea who you are.” replied Bhusuku. “But I myself am Manjushri!” replied the Bodhisattva. “Then please grant me the power and full realization of every quality of perfect insight.” Bhusuku implored. 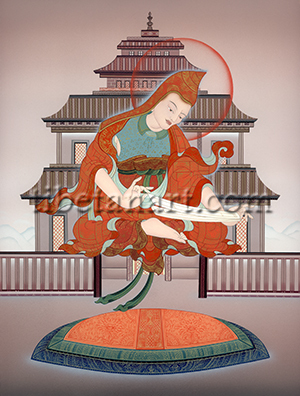 “Consider it done,” said Manjushri. “Recite your sutra in the morning,” and then he suddenly vanished. That morning King Devapala and his entire court, along with all the monks, scholars and people of that region came bearing offerings in the expectation of witnessing this idle monk's public humiliation. But when Bhusuku arrived he confidently mounted the temple throne and instantly began to levitate above its cushions, while light rays emanated from his body. “Now would you like me to recite a traditional sutra or recite one of my own composition?" Bhusuku asked the king. Then Bhusuku recited the ten chapters of the now famous Bodhicaryavatara sutra on ‘The Path to Enlightenment’, and having delivered this sublime teaching he rose high into the sky. The king and his courtiers, along with all the scholars, monks and people were amazed by this inspiring transmission, so they made offerings and renamed him as Shantideva, meaning ‘Divine Peace’, for he had transformed their spiritual pride. Nalanda’s scholars then requested a commentary on Shantideva’s amazing teachings, which he immediately gave to them. However, when they asked him to become Abbot of Nalanda he refused, and after leaving his robes, alms-bowl and other monastic possessions on the temple altar he departed in secret to another country, where the legend of his life continued to unfold.